The Palm Springs area offers active adults the ideal climate, location, and lifestyle for retirement. The Palm Springs area is a hot spot in Southern California that consists of popular cities like Palm Desert, Indio, Palm Springs, Desert Hot Springs, La Quinta, and Indian Wells just to name a few. It was made famous a few decades ago thanks to celebrities like Frank Sinatra and Bob Hope who would flock to this desert oasis for a fun and quick vacation, escaping the hustle and bustle of Los Angeles. The Palm Springs area still attracts celebrities from movie stars and musicians to wealthy Los Angeles socialites, but it also draws in baby boomers from all over the country. With its beautiful landscape and climate, endless recreational activities, high-end shopping and dining, and cultural attractions there's plenty to keep retirees busy here. The Palm Springs area has a long list of 55+ communities that cater to the active and social lifestyle that retirees often seek. Another draw to this desert oasis is the reasonably priced homes. When compared to other cities in California like Los Angeles and San Francisco’s expensive real estate, it’s no wonder why so many retirees choose the Palm Springs area as their ideal retirement destination. Here we list five reasons to retire in the Palm Springs, California area. Snowbirds should pack enough sunblock because these desert cities get over 300 days of sunshine a year. Retirees choose to retire in the Palm Springs area for the beautiful year-round hot and dry climate. Temperatures can rise up to 100 degrees in the summer during the day and drop to about 80 degrees at night. Winters days are warm with temperatures ranging from 70 to 80 degrees and dropping to about 40 degrees at night. Baby boomers also don’t have to worry about packing a raincoat or umbrella because annual rainfall is less than five inches per year. 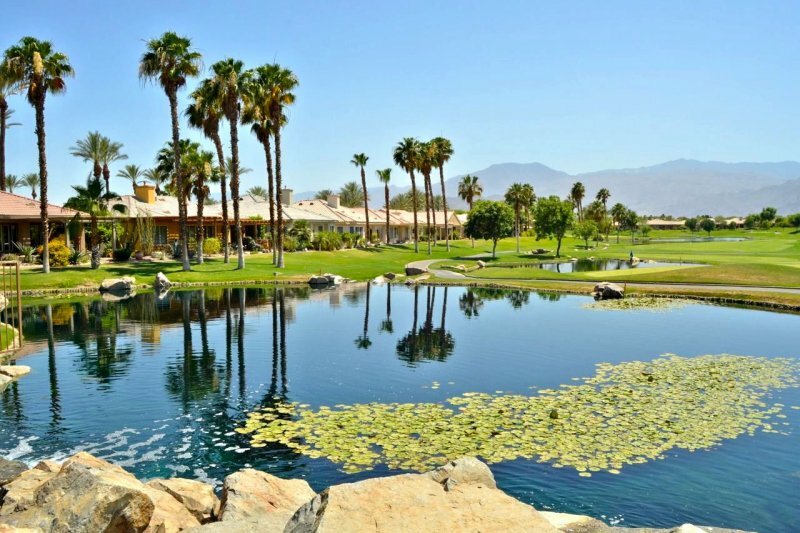 Baby boomers moving to cities surrounding the Coachella Valley in Southern California enjoy great amenities and recreation as well as breathtaking mountain views. Outdoor enthusiasts can find recreational opportunities like hiking in the Palm Springs Aerial Tramway, Tahquitz Canyon, or along the San Jacinto Mountains, which rise 10,000 feet above the valley floor. Adventure seekers can rock climb at Tahquitz Peak or run the Chino Canyon 5.5 mile-long trail. For a more relaxed setting, retirees can visit the Living Desert Zoo and Gardens to see native species and animals. The Moorten Botanical Garden, which is a popular historical landmark in Palm Springs, features desert plants, ancient fossils, crystals, and gold-mine relics as well as garden tours. Museums are sure to please retirees who want to learn about the history and culture of the area as well. Boomers can check out the Palm Springs Art Museum, Cabazon Dinosaurs Museum, Palm Springs Air Museum that’s full of WWII combat aircrafts and aviation art, or Tramway Gas Station to view modern architecture. Let’s not forget about casinos and golf, which are also popular attractions in this area. Retirees can check out the Vegas-style Fantasy Springs Resort Casino or Agua Caliente Casino Resort Spa. Many of the active adult communities offer great amenities like Trilogy at La Quinta or Indian Ridge Country Club, which provide residents with access to 18-hole championship golf courses. The Palm Springs area is also known to have some of the best medical facilities that appeal to many active adults. There are several hospitals in the Coachella Valley that are ranked highly, one of which is the Desert Regional that was ranked as Best Regional Hospital by U.S. News and Eisenhower Medical Center that’s nationally ranked for geriatric treatment. Other healthcare options in the area include San Gorgonio Memorial Hospital, John F. Kennedy Memorial Hospital, and Hi-Desert Medical Center. Retirees enjoy living in 55+ communities in the Palm Springs area because it’s actually friendly toward their pocket books. Although the cost of living is a bit higher than other places, residents tend to spend less on homes, transportation, and utilities. Unlike other Southern California cities, homes surrounding the Coachella Valley are reasonably priced starting in the low $200s. Baby boomers can find a beautiful single-family home in an age-restricted neighborhood like Sun City Shadow Hills in Indio for under $300,000. And with great resort-style amenities located within the community’s gates, residents never have to travel far to enjoy activities or social events. They can also get a few tax benefits by living in this area such as untaxed Social Security benefits, options for property tax relief, and a reduction in the taxable value of their property. The local economy of these desert cities is typically driven by medical care, tourism, real estate, and the influx of retirees moving here. Some of the large golf resorts, hotels, and country clubs employ thousands of people making this area popular with vacationers, retirees, and locals. A strong economy and low unemployment rate make the Palm Springs area a thriving and vibrant destination for baby boomers.